The Glory Lily - otherwise known as the Gloriosa Lily or Gloriosa rothschildiana - is perhaps one the most delicate and beautifully flowering climbing plants you will ever come across. A native of North Africa, this exceptional plant was named after Baron Z.W. Rothschild, a renowned ornithologist who brought it back to enter it into the English Horticultural Society’s exhibition of 1901. Related to the Lilium family, the Glory lily is a tender tuberous rooted perennial climber that will require cold protection in all but the mildest areas within Great Britain. 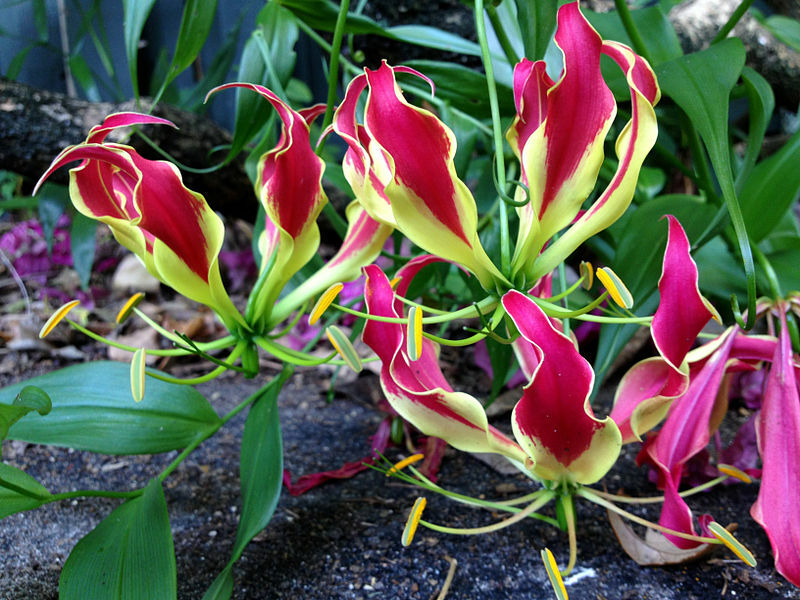 Despite its tropical looks the Glory Lily is relatively easy to grow. It is best off started in pots and then transferring them to the ground during May to June once the threat of late frosts have passed. Similar to the oriental lilies the growth of the Glory Lily is upright at first, but these are climbing plants that love to scramble. If you look carefully you'll see that the tip of each leaf has a barbed end which it uses to support itself on whatever is at hand to climb on. With an overall height of about 2 metres you can place this plant either against a small piece of trellis against a sunny wall or you can place it amongst the borders with the support of an ornamental obelisk. You should expect to see the first set of flowers opening out around July. Wherever you place it it's important to make sure that it can get as much sunlight and ventilation as possible. If you intend to grow it in a pot , choose one with a bit of weight to it, preferably an unglazed, porous terracotta pot, that way when the plant gets a little top heavy it is at less risk of being blown over. Also you can consider planting the whole pot into the ground for better protection making it easier for lifting before the cold weather of winter is back upon us. Typically, the Glory Lily will be purchased as pre-packed root sections in the spring. Using loam-based compost - with either horticultural grit, perlite or vermiculite or bark chippings to aid drainage. To help give it a head start you can also throw in a handful of growmore or bone meal, just make sure that it is mixed in thoroughly before planting. Plant the bulbs 3-4" deep, in larger pots you can plant several specimens so long as they are about 6" apart. Just lay them on their sides and cover them up - they will know which way is up. Water well, thoroughly soaking the compost and then allow any residue to drain away. If kept in a warm room you can expect to see new shoots in two to three weeks. During the growing season the Glory lily should be watered thoroughly, but again, they will need to be allowed to dry out almost completely before re-watering – never leave them waterlogged or standing in water as this can encourage rots. When growing begins in the spring they should be given a liquid feed once a week to encourage new growth. Later on in the season a half strength fertilizer added to the water every two weeks will keep plants blooming strongly throughout the summer and sometimes further into early autumn. To save your tubers from one year to the next it’s best to stop watering the plants from about the end of October. Allow the compost to fully dry off and any foliage to die back down. Now place the pot in a warm dry area over the winter period where temperatures will not go below 5°Celsius. As soon as the threat of frosts has passed, the compost has been allowed to dry out. You may wish to re-pot your Glory Lily into a larger one at this time. The new seasons growth should appear after about three weeks, at which point you can put your glory lily back outside.